Inverness surged into a three goal lead inside 20 minutes, Nathan Austin bagging the first two goals and Liam Polworth adding the third with a low shot from outside the box. It remained 0-3 at the interval but substitute Lawrence Shankland made his presence felt as he set up Declan McDaid to open Ayr's account eight minutes after the break. Shankland scored from a free kick with five minutes to go to set up a tense finish but Inverness just managed to hold on to take all three points. 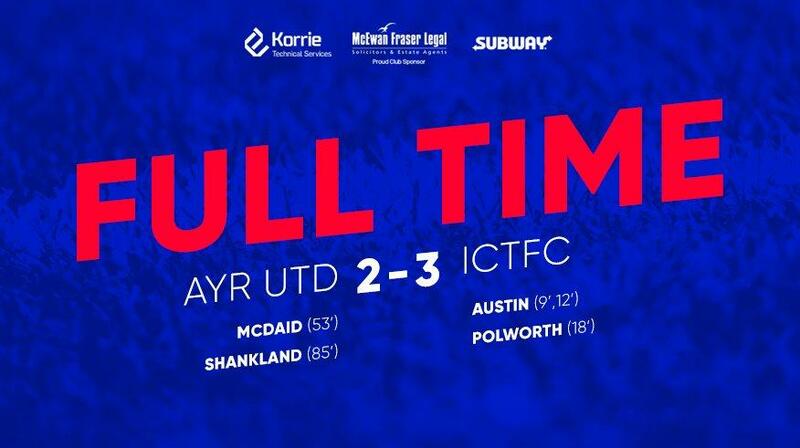 That's a tremendous result that has put us back into the top four and denied Ayr a return to the top of the table. John Robertson made two changes to the team that drew 2-2 at Falkirk. Jambos loanee Anthony McDonald started in place of the injured Aaron Doran and George Oakley replaced Jordan White. Cammy Mackay kept the keepers jersey with Mark Ridgers still out with back pain. Ayr kept faith with Craig Moore and Michael Moffat up front which meant that Lawrence Shankland was on the bench. Nathan Austin started the ball rolling towards the Somerset Road end on a freezing night at Somerset Park in front of 1559 shivering fans. The 76 visiting ones would be warmed up well before half time. To start with a round of applause for the recorded 76 fans who made it to Somerset Park despite the road conditions in both North and South directions. The records also show that there was 1559 in total attendance although it looked more to me. And we were then treated to the best 9 minutes of the season. The first, in the eight minute, had a degree of luck to it. Superb through ball from Polworth and Nathan Austin took it round Rose and Doohan with a little help from Rose but he finished well which has not always been the case this season. And just as one bus leaves another turns up, three minutes later (certainly wasn’t sponsored by ScotRail). A terrible pass by Smith found Oakley who played in Nathan Austin who again rounded the keeper but knocked it in with his left foot. Not sure how the defender on the line missed the clearance but hey-ho. And as most if not every fan in the ground were shaking their heads we go three up. Liam Polworth sweetly stuck a low 20 yarder which went in via the post. As good a strike as I have seen this season. But any chance of a 7-0 Somerset repeat were soon dashed as Ayr appeared to waken up. They could well have got a goal back before half time. A header came off the crossbar and Cammy MacKay made a fine save just on the half time whistle. In many ways it was fortunate for us that we held out as the second half may have been even more arduous. Enter Lawrence Shankland for the second half. It felt that the combination of a McCall bollicking, Shankland enthusing the crowd and Ayr lifting their effort made the second half a very, very long one. The first goal in the 53rd minute was made by Shankland and finished off by McDaid. Although I would have given the “assist” to Jamie McCart – although the ball did appear to hit a divot. There were two penalty claims thereafter although I feel that both being denied were the correct decision. The ball clearly played Tremarco’s hand and Oakley had lost the ball in a rumble in the box. Also in the 58th minute Robbo made his first substitution which basically puzzled me. He hooks Austin whos’ pace was the main worry for the Ayr back four and would have been a bonus on the break. And he brings on White ?!! Trafford replaced McDonald in the 70th minute but that was understandable. McCauley replaced Oakley in the 82nd minute and that was one that may have been better happening 15-20 minutes earlier. And three minutes later the inevitable Shankland goal made us fear that another draw was on the cards. And it was – and you could hear a collective sigh of relief from 76 Highlanders when Muirhead headed over in injury time – although I thought that Tremarco’s presence put him off. Ayr United manager Ian McCall: "You can't give teams a three-goal start. I thought they had 20 minutes, then we dominated, but we couldn't get an equalizer – have to agree. Inverness CT manager John Robertson: "You know if you lose a goal here, the atmosphere can change and it's a brilliant throw back coming here – spot on again. Robbo added - "If we win on Saturday, we're back in the hunt going into the break for the cup. We're just targeting whatever team is directly above us. – who can argue against that ? MacKay - Young Cammy did well and I thought that his save before half time was a real game saver. top. At the time I was critical of his Alan Rough impersonation for the second goal but the free kick looks as if it took a mean deflection. Rooney – Disappointed me. Always looks good going forward but I felt that most of Ayr’s chances came down their left wing and Rooney lacking pace. McKay 😎– No nonsense and why not. Tremarco – Best defender for me and good to see him back at full fitness. Welsh – An “old head” which we need at the present time. Looked more like a captain. Polly – My MOM. Super pass for the first goal and super strike for the third goal. Also worked hard which often is lacking at home. McDonald – Thought that Robbo would have played McCauley from the start on physique alone. Has a look of a Doran about him – which we need. Suspect that he will be more effective at home. 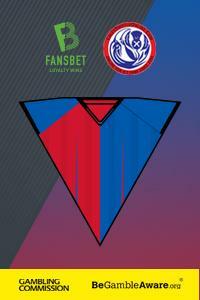 Austin – Best game in our colours for me. Two good finishes and worked the line very well. So why the hooking in the 58th minute ? White – 😁Actually thought that he was a good out option and he held the ball up quite well. McCauley – Wrong game to judge. Subs (not used): Hare-Reid; Hilton, Ecrepont, McCowan. Polworth, Welsh, Chalmers, Austin (White 58), Oakley (McCauley 82). Subs (not used): MacKinnon; Harper, McHattie, Mackay.